How can one possible write a review of a book that comes as an answer to your prayers? It is not possible. One of my most insistent prayers this past year has been in form of a question, "God, how can I possible embrace Truth and don't miss loving my neighbor -the one who believes things contrary to your Word-? How can I possible do that in a way that will honor you and the Truth you have entrusted to your Church and not sin against you by not loving others?" 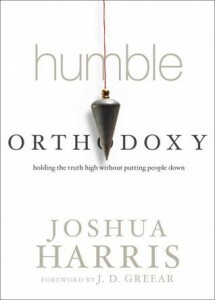 Joshua Harris in his little book, Humble Orthodoxy, doesn't provide all the answers to this dilemma, but he does go to the heart of it. He boldly admonishes us with the Scripture against spiritual (orthodoxy) pride and reminds us that we have been called to embrace humility. The message of this book cannot be ignored, nor the call to fall on our knees in prayer asking forgiveness for the times in which we have, "in the name of discernment," puffed ourselves up. the more I will pray that the Lord will bless him. but as Jesus who is always interceding for us. All this is burning in my heart because I believe in a God that changes people -starting with me-. I believe in a merciful Father who hears our cries and brings us -each one of us- to repentance. I believe that even though we have been commanded to avoid those who cause divisions and create obstacles contrary to the doctrine that we have been taught in the Scriptures (1), we are also called to love them by interceding fervently for them -and for us too, so that we might be delivered from all spiritual pride and presumptuous attitudes which we all know are like the evil of idolatry (2)- I believe that if God has not "given-up" on me, I will never "give-up" on any person, but I will keep on praying with hope for them. God is good and God is able to save and open our eyes. "Reading 2 Timothy reminds me of the sad reality of falsehood and lies. I wish I lived in a world where beliefs were like different flavors of ice-cream -no wrong answers, just different opinions. But that's not the world we live in. We live in a world in which God's true revelation and the smooth words of charlatans and false prophets compete for our attention..."
"Love for God and love for neighbor require us to oppose falsehood. There is nothing more unloving than to be silent in the face of lies that will ruin another person. Sometimes love demands that we say, "This philosophy, no matter how plausible or popular, is not true. This person, no matter how likable, gifted, or well intentioned, is teaching something that contradicts God's Word; therefore is untrue." "When it comes to orthodoxy; it's not about you or me. The truth is not our truth; it comes from God. And the ability to uphold it with loving humility comes from him too." "The message of Christian orthodoxy isn't that I'm right and someone else is wrong. It's that I'm wrong and yet God is filled me with grace. I am wrong, and yet God has made a way for me to be forgiven and accepted and loved for eternity. I am wrong, and yet God gave his Son, Jesus, to die in my place and receive my punishment. I am wrong, but through faith in Jesus, I can be made right before a holy God." "Sound doctrine is vital. Godly example is essential. But they are not enough. Apart from humility of heart, we will be like Pharisees and will use the truth as a stick to beat other people over the head. And God will be dishonored in that. If we would honor God, we must represent truth humbly in our words, in our demeanor, and in our attitude." "One test for whether we're pursuing humble orthodoxy is this question: Are we giving as much energy to obeying and being reformed by God's Word personally as we are to criticizing its detractors?" And beside that quote I wrote this, "The spread of egalitarianism in the church concerns me and grieves me terribly. BUT, I must ask myself, am I living my role as a submissive wife in a way that faithfully represents the model of the church and Christ? Am I daily pressing on to become a godly wife who seeks to bring glory to God and honor and respect to my husband in all I do? Am I living in such a way that by my attitude as a wife, people around me can see a picture of the gospel?" "Truth that is divorced from personal practice is hypocrisy, and living truth becomes a living lie when we fail to obey it ourselves." "There's a difference between having a critical mind that carefully evaluates and having a critical spirit that loves to tear down and belittle." "We can demonstrate a humble orthodoxy, holding on to our identity in the gospel. We are not those who are right; we are those who have been redeemed." I would like to keep this book at hand, in the "medicine cabinet," so that any time I feel the temptation to be arrogant and critical instead of prayerful and merciful, I will read it and be reminded of what God's Word clearly says.